If you love shortbread, (who doesn’t) and if you love just a little dessert at the end of a meal, not too sweet and just enough to end the meal, this is the dessert for you. This easy almond pear tart with a shortbread crust is also is the perfect dessert for a wine and cheese party. It’s more than a cookie, but not quite a big dessert that will weigh you down. The crust is sweet, but not too sweet and the cream is just enough to hold together ripened pears flavored with vanilla and bourbon, and textured with crunchy, slivered almonds. Some neighbors came over the other day to see the pictures of our trip to France and Italy. We set the pictures up on the TV monitor and served a lovely wine and cheese spread, complete with melon, prosciutto, and a delicious fig cake that had bits of chocolate in it. I took this almond tart (from Chez Panisse) that I’ve made more times than I can count and rearranged it to include the sweetness of ripe pears. I also changed the shortbread crust recipe, which is now finally perfected. This would be lovely served with a sweet wine or even a glass of port. 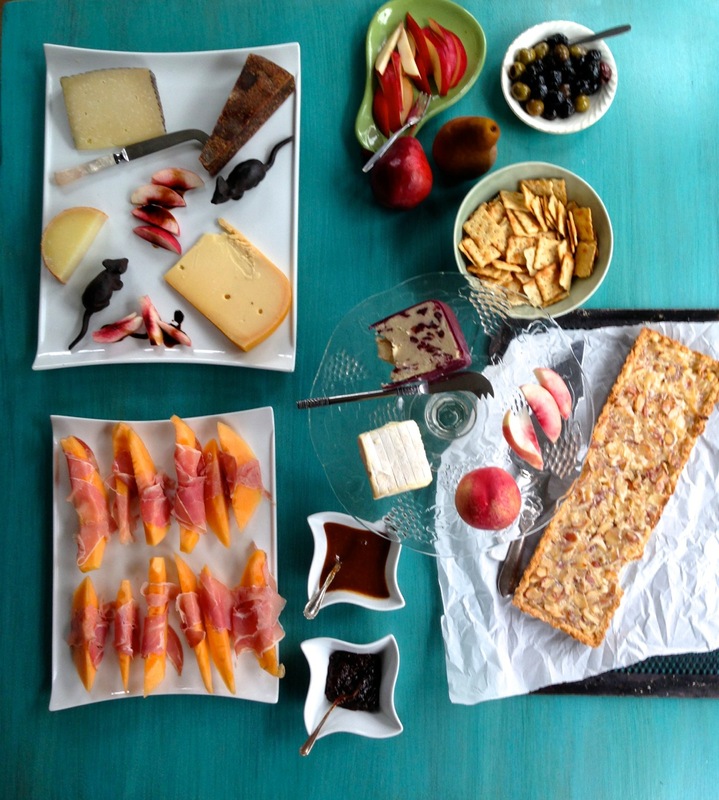 A wine and cheese party is perfect way to invite people when there is no time (or desire) to actually cook. Everyone can serve themselves, take a nibble here and there, and enjoy the conversation. This is an explosion of flavors and textures. Sweet, salty, juicy, creamy, tart, crusty coming together and I’ll talk about that in a separate post. The texture of this easy almond pear tart was crumbly, sweet, tangy, salty and crunchy, just that last perfect bite of food. If you like the idea of pears and almonds, you might also love this pear almond clafoutis, a lovely brunch recipe. 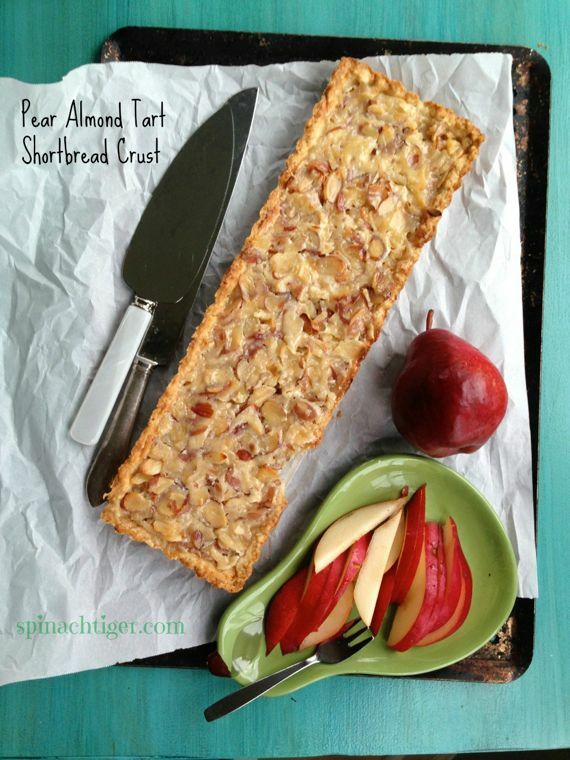 A perfect easy to make almond pear tart on a shortbread crust, served at a wine and cheese party. Just sweet enough to end the meal. Mix flour, sugar, salt and zest. Add in the frozen butter and mix in food processor for 10 seconds. Add egg. Add in cold water and mix in processor until a dough is formed. Wrap in plastic and refrigerate for at least one hour. Take out, allow to warm up for 10 minutes. Put into a tart pan. You will probably use your fingers to press into pan. Refrigerate for 15 minutes. Use fork to put holes into dough. Bake for 8 minutes 425. Reduce to 400 and bake for 12 minutes. Heat cream, pears, bourbon, sugar until cream becomes translucent. Add almonds. Allow to sit for 15 minutes. Pour into prepared pan with removable bottom. You may have some left over. Bake at 400 for 25-30 minutes. Put another pan below as it may bubble over. what size round tart pan is recommended ? Thank you? This sounds absolutely wonderful. I love shortbread and almonds! Yum! It all sounds prefect, both the wine and cheese party and the wonderful dessert to finish! Love the rectangular shape! Great seasonal recipe and gorgeous photography. Yum.